BELOW Scroll down to view summaries of each chapter. One the reasons why Hamlet is Shakespeare’s longest play is that its title character Prince Hamlet talks so much. Yet no one in drama has revealed so little of himself while saying such a lot. Like his creator, Hamlet is an actor (“I perchance hereafter shall … To put an antic disposition on”, 1.5) and a playwright (“The play’s the thing / Wherein I’ll catch the conscience of the king”, 2.2). Blocked from returning to the life he loved at Wittenberg University, the prince faces “a sea of troubles” (3.1) and is “benetted round with villainies” (5.2). Such is his despair that by the second scene he wishes he could write himself out of the drama in which the Shakespeare has cast him—“How weary / His law ’gainst self slaughter” (1.2). The “Who’s there?” question posed in the opening line is one the prince asks of himself all through the play. 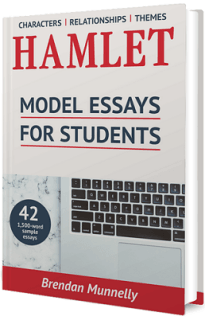 Who is Hamlet, and does he “win at the odds” (5.2)? More than any other character, Claudius brings about—and entirely deserves —his own downfall. Cast by the playwright of Providence as a secondary figure in the shadow his brother, Claudius rewrites the script so that he now shares the throne and bed of Queen Gertrude. As the play unfolds, Claudius’ poison metaphorically spreads outward until the natural human relationships of friendship and romantic love are corroded by mistrust. Claudius finds he must plot a second murder to cover up the first. When this plan fails, his next “exploit” (4.7) leads to the death of the woman he loves. When Gertrude reaches for the poisoned goblet, his need to conceal his murderous scheme against her son means Claudius can only manage to utter a half-hearted “Gertrude, do not drink” (5.2). ‘Have you eyes?’ (3.4), Prince Hamlet demands of his mother. The relationship between old King Hamlet’s widow and the villainous Claudius is a tragic tale of evil exploiting self-deluding naivety. The person that Prince Hamlet most bitterly accuses of fickle disloyalty (“Frailty thy name is woman”, 1.2) in fact remains steadfastly at the side of her second husband. In 4,5. she confronts the mob-leading, sword-wielding Laertes when she fears the throne she shares with Claudius is under threat (“Laertes shall be king!”), and defends her husband from any part in Polonius’ death (“But not by him”). But Gertrude’s “o‘erhasty marriage” (2.2) dooms her life and the lives of everyone around her. Her wished-for, happy-ever-after fairytale descends into a nightmare and ends in a bloodbath. Ophelia’s sanity is overwhelmed by Elsinore’s maddening world of deception and betrayal. Her “self-slaughter” (1.2) is her revenge against everyone who dismissed, silenced and humiliated her. If only with “maimed rites”, Ophelia is buried in a Christian graveyard on the “great command” of the king and against the wishes of the “churlish priest” (5.1). But even at her own funeral she is overshadowed by two male characters who jump into her grave and fight over who loved her more. ‘Kill your uncle, ignore your mother, avoid losing your sanity, and don’t worry about my suffering in the afterlife’—in simple terms, these are the Ghost’s four instructions in 1.5 to Hamlet. But, by the play’s end, the prince has broken every one of the directions issued by the “questionable shape” (1.4) like “the King that’s dead” (1.1). After many “purposes mistook” (5.2) and mirroring Laertes’ journey from revenge to forgiveness, the prince finds another way to keep the promise he made to his late father’s memory: “Rest, rest, perturbed spirit!” (1.5). In his one act as king, a dying Hamlet surrenders Denmark to the son of his father’s old rival, whose own father was killed by old King Hamlet on the day of the prince’s birth. In so doing he grants his “dear father” (2.2) something more than vengeance: atonement for his land-grabbing, “Extorted treasure in the womb of earth” (1.1) sins committed “in his days of nature” (1.5)—and with it escape from his afterlife torment in the “prison house … fires” (1.5). Uncle and nephew provide examples of both external and internal conflict. They are two individuals at war with each other—and themselves. Claudius is haunted by the murder he has committed (“O heavy burden!”); Hamlet by the one he hasn’t yet (“Am I a coward?”). They both “stand in pause” (3.3). Hamlet enjoys play-acting in theater. Claudius practices play-acting in politics. The prince’s happiest moment in the play is the Players’ arrival (“there did seem in him a kind of joy”, 3.1). In 4.7, the king delights in conspiring “a little shuffling” with Laertes: a sharpened, tainted sword and—in the event of a “bad performance”—a poisoned wine goblet. Hamlet describes his uncle as “canker of our nature” (5.2). To Claudius, Hamlet is “th’ulcer” (4.7) who is “like the hectic in my blood” (4.8). Their relationship begins with mutual suspicion, escalates into a psychological battle, and ends with defeat for both and victory for the rival kingdom of Norway. No two figures in Hamlet are further apart in character and outlook than Prince Hamlet and his mother, Queen Gertrude. He is an anguished seeker of truth and meaning; she a contented, status-loving materialist. Hamlet torments himself that his continual “Looking before and after” (4.4) is but an excuse for cowardice. The live-in-the present Gertrude (“all that is I see … / Nothing but ourselves”, 3.4) is puzzled why her son struggles to do the same. At the play’s beginning, Ophelia says Hamlet “hath importuned me with love / In honorable fashion” (1.3). Yet we also learn that the prince wishes to leave Elsinore. So, we may well wonder with Polonius’ daughter: “I do not know, my lord, what I should think” (1.2). Their relationship then becomes one of “purposes mistook” (5.2). Ophelia mistakenly believes her rejection of the prince has caused his insanity. Hamlet mistakenly thinks his pretend madness is the cause of her rejection. Who is “the more deceived” (3.1)? Ophelia’s surrender to death in a “weeping brook” (4.7) recalls Hamlet’s earlier despairing wish that his “flesh would … resolve itself into a dew” (1.2). Her death is followed by Hamlet’s expression of love and duel with Laertes (“I loved Ophelia … I will fight with him upon this theme”, 5.1) in which both Ophelia’s brother and lover meet their deaths. Horatio’s relationship with Prince Hamlet is a genuine friendship in an Elsinore where other relationships are poisoned by deception and betrayal. Horatio is Hamlet’s trusted companion in life and vows to remain the keeper of his memory after the prince’s death. However, each friend is selective in what he shares with the other. Horatio does not mention to the prince his interpretation of the Ghost as an “omen” that “bodes some strange eruption to our state” (1.1). Hamlet does not disclose to his friend why he puts on his “antic disposition” (1.5) and never discusses with Horatio his relationship with Ophelia. Hamlet admires Horatio’s Stoic detachment from the concerns of the world: “As one, in suffering all, that suffers nothing” (3.2). But the prince’s political position means he cannot opt to be only a passive observer of events, “for on his choice depends / The safety and health of this whole state” (1.3). And does Horatio’s “sweet prince” (5.2) exploit his friend’s loyalty with his seeking to be remembered with a heroic if improbable tale of divinely-inspired rescue by pirates? The on-stage royal relationship is far removed from the unrestrained sensuality which King Hamlet’s Ghost luridly imagines. It more resembles that of a middle-aged, married couple which, of course, Claudius and Gertrude actually are. Neither king nor queen succeeds in winning Prince Hamlet’s support for their marriage. He believes that “Father and mother is man and wife, man and wife is one flesh” (4.3). As long as she is joined in marriage to him, and they share throne and bed, she is one person with Claudius. In the final scene, Gertrude dies by the same means her second husband Claudius used to murder her first: poison. A king murdered, an inheritance stolen, a family divided: Elsinore’s older generation destroys its younger when two brothers—one living, one undead—battle in a “cursed spite” (1.5) over a crown and a queen. Hamlet is fundamentally a story about story-telling: the stories we tell others (the murderously deceitful Claudius: “a little shuffling”, 4.7); the stories we tell ourselves (the opportunistically self-deluding Gertrude: “All that is I see”, 3.4); and also about seeking life’s meaning and guidance for proper action in stories (Prince Hamlet: “The play’s the thing”, 2.2). The play ends in a “feast” of “death” when the characters’ “deep plots” all rebound back on their “inventors’ heads” (5.2). Has villainy been “justly served” by “providence” (5.2), or has the ending been just another turn of the “wheel” of “fortune” (2.2) of which the Players spoke? Hamlet contains two revenge stories, the second triggered by the prince’s “rash and bloody” (3.4) murder of Polonius first halfway through. The Ghost’s revelations send Hamlet retreating inward into untrusting isolation. Polonius’ bereaved son instead reaches outward to lead a rebellious, castle-storming mob against the king. Laertes’ words of “a noble father lost, / A sister driven into desperate terms” (4.7) echo Hamlet’s appraisal of his own situation: “a father killed, a mother stained” (4.4). At the play’s end, an accidental swapping of swords between the two duellers Laertes and Hamlet is followed by a genuine exchange of forgiveness. Their deadly duel reverses the outcome of another fought thirty years before, as Young Fortinbras from rival Norway succeeds to Denmark’s vacant throne. And so the revenge sought by the Ghost of old King Hamlet on his brother in act one becomes in act five the revenge of old King Fortinbras on old King Hamlet. “Who’s there?” asks the castle guard Barnardo as midnight approaches in the play’s very first line. His question expresses an underlying theme of the play: the difficulty of correctly identifying the true, authentic selves of others—and by extension, of distinguishing between appearance and reality, between what ‘seems’ and ‘is.’ Echoing the grave-digger’s comment that “an act hath three branches” (5.1), Hamlet is a play-long triple pun on the verb ‘to act’: to take action, to behave deceitfully, and to perform in theater. Hamlet’s ploy with Horatio of using professional actors to investigate Claudius’ possible “occulted guilt” (3.2) mirrors the king’s and Polonius’ earlier casting of Rosencrantz, Guildenstern and Ophelia as amateur players in contrived performances to uncover what lies beneath Hamlet’s “turbulent and dangerous lunacy” (3.1). Ironically, the watchful guards of act one were looking in the wrong direction. Denmark was not conquered by an external military campaign; it collapsed under a web of domestic deception. “My wit’s diseased”, Hamlet tells Guildenstern in 3.2. But is the prince really insane? If so, is it because of some psychological defect in his personality? Or has Hamlet lost his reason as a result of being “benetted round with villainies” (5.2)? And if Hamlet is not as “Mad as the sea and wind, when both contend / Which is the mightier” (4.1), why is the prince pretending to be? As for Ophelia, no one can doubt her poignant descent into very real trauma.